andhrazone: Center continues to pay deaf ear to AP’s woes! Center continues to pay deaf ear to AP’s woes! 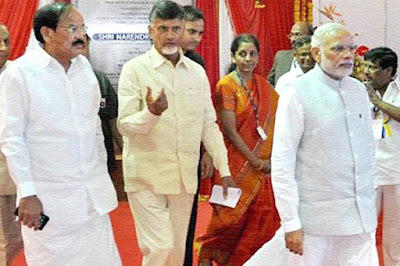 Narendra Modi led Central government is continuing to be insensitive to Andhra Pradesh’s plight. The cash strapped state is reeling under several financial pressures and is totally relying on the ways and means and overdraft facilities. Modi government had announced 1000 Crore for the state couple of months ago – 300 Crore for Polavaram, 350 Crore for backward districts and 350 Crore for Capital. This 1000 Crore even though meager was announced two months ago but is yet to reach AP’s account. AP government for its minimum maintenance is selling bonds and bringing loans up to 1000-1500 Crore in open market every month. But center did not allow that much this month and restricted the loans to 550 Crore this month. There are 2000 Crore pending bills with the government and Pensions by this month end require 500 Crore. So going overdraft is imminent. On the other side, last night center announced 3250 Crore package to Delhi but not a single penny to severe rains hit AP or Telangana.